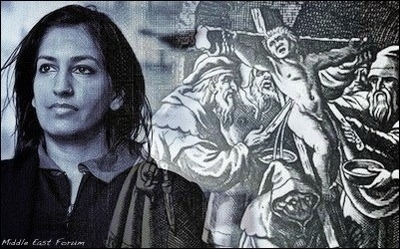 Rutgers University professor Jasbir Puar is leading the charge to revive the medieval anti-Jewish blood libel. Leave it to the Middle East studies establishment to defend the vilest forms of conspiratorial anti-Semitic rhetoric, provided it's in service of demonizing Israel. Jasbir Puar, the Rutgers University women's and gender studies professor and Israel-boycott advocate who, in a controversial February 3 lecture at Vassar College, charged the IDF with the organ harvesting, deliberate maiming, and stunting of "Palestinian bodies," can certainly count on support from its ranks. Notorious Israel-bashers such as Rashid Khalidi (Columbia University), Joel Beinin (Stanford University), and Steven Salaita (American University of Beirut) are among the signatories to an open letter to Vassar College President Catharine Bond Hill defending Puar against an alleged campaign of "vilification and hatred" following her inflammatory lecture. Unlike the vast majority of academic jargon-filled apologias for bigotry that populate the lecture circuit, Puar's talk was widely covered and rightly condemned by a disgusted public. In evoking "hate mail and other threats" against Puar, the authors allude to the specter of death threats — whether real or imagined — a time-honored tradition among academics unaccustomed to the twin horrors of criticism and accountability. The letter inveighs against the particular evils of a February 17 Wall Street Journal op-ed by Mark G. Yudof, former University of California president, and Ken Waltzer, professor emeritus of history at Michigan State University, titled, "Majoring in Anti-Semitism at Vassar." Yudof and Waltzer had the temerity to point out the obvious: by accusing Israel of extracting organs from Palestinians for medical research, Puar was "updating the medieval blood libel against Jews." Puar's lecture was co-sponsored by eight academic departments at Vassar College. In the face of such censure, and unable to silence Puar's critics, the letter's authors urge President Hill to take the drastic action of writing "a letter to the Wall Street Journal . . . condemning in no uncertain terms the unjustifiable attack on Vassar and on Professor Puar." Take that, free speech! With Puar's case as the catalyst, the open letter goes on to bemoan the supposed "suppression of speech or academic freedom related to Palestinian rights or Israeli policies" on "college and university campuses." Predictably, it blames the "millions of dollars in donations" from "political pressure groups" and "right-wing, hawkish Israel advocates such as the casino mogul Sheldon Adelson and media owner Haim Saban" — otherwise known in conspiratorial circles as the Israel Lobby. Of the destructive impact of the millions of dollars flowing into academe from Saudi Arabia, Turkey, Iran, and other despotic Muslim nations, it authors are conveniently silent. Inverting the truth, the letter laments the "pernicious and discriminatory" effects of "anti-BDS campaigns on student activists, faculty and visiting scholars [emphasis added]." Clearly, it is not those opposed to the singling out and boycotting of academic institutions belonging to the world's sole Jewish state who are guilty of discrimination. In fact, suppression of speech, intimidation campaigns, and infringements on academic freedom are typically directed at pro-Israel (or scholarly, non-politicized voices) on campus, not the other way around. If, as the authors allege, there is "a climate of fear and intimidation that discourages student activists and faculty and scholars who write or speak out on behalf of BDS and justice for Palestine," it is an unadulterated failure. The very fact — trumpeted in the letter — that Puar's lecture was co-sponsored by eight academic departments, including, sadly, the Jewish Studies Program, is evidence of the BDS movement's increasing legitimization. A member of the advisory board for the U.S. Campaign for the Academic and Cultural Boycott of Israel, Puar contradicted proponents' oft-repeated claim that BDS is peaceful by bragging about its utility to the "armed resistance in Palestine." It's little wonder her supporters are dismayed that BDS opponents seized on this disclosure. The inescapable conclusion is that the people who drafted this letter and the hundreds of academics who signed it believe that speculating about Israel stealing organs from dead Palestinians due to the requirements of a "weaponized epigenetics" is "grounded in serious scholarship and thorough research" and reflects "the highest professional and scholarly rigor." It is damning that leading voices in Middle East studies heap the highest praise upon a lecture that is little more than a regurgitation of the vilest anti-Semitic charges of the past millennium. With this episode, an intellectually and morally bankrupt field has sunk to a new low.